Special 3-5 is the fifth level of Special 3 in Super Mario 3D Land. It is based off World 6-4. 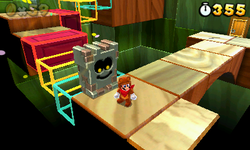 The player starts out on a wooden platform and must cross three Beat Blocks to get to the next platform which contains a Wallop. After getting past the Wallop, the player must then ascend three more Beat Blocks to reach a platform with two Prongos and three ? Blocks. The middle ? Block contains a Poison Mushroom, whilst the other two contain a Coin. The player must then get past another Wallop, before reaching a Door to the next area. The player will then be in an inside area where they must get past another Wallop and ascend two sets of Beat Blocks before going to the next area. In the next area the player can get the Checkpoint Flag before crossing a set of Beat Blocks and getting past two Wallops. The player must then ascend a set of Beat Blocks and must continue along another set of Beat Blocks, that have Spiked Bars rotating around them. After this the player will be on a platform with a Prongo and a set of Beat Blocks to the right, with a Spiked Cylinder rolling around them, the player will need to cross three more sets of Beat Blocks before reaching the Goal Pole. Star Medal 1: When the player goes through the first door, the Star Medal is floating out of reach, the player will need to use a Wallop to get the Star Medal. Star Medal 2: On the yellow Beat Block on the right just after the Checkpoint Flag. Star Medal 3: Floating above the second Spiked Bar.